Unfortunately, we will always remember him as a founder and leader of America’s anti-gay industry, someone who exacerbated the nation’s appalling response to the onslaught of the AIDS epidemic, someone who demonized and vilified us for political gain and someone who used religion to divide rather than unite our nation. On a positive note, I guess I can credit Falwell for politicizing people like me who never cared much about politics until we were under political attack. Last month I was cleaning out some files and I came across a printout of an email that I sent to Falwell on September 15, 2001, after I heard the 9/11 remarks quoted above. I had forgotten about it, but the memories came back to me as I read it. When I heard Falwell’s remarks on September 14, the day after he made them, I was furious. For over two decades this man had been blaming gay people for anything and everything wrong with America. It was a last straw for me. There I was, reeling in the aftermath of the terrorist attack just like every other American, and this man with a microphone blames it on me? All my history with him and his ilk came crashing down on me in that moment. I was livid. There was no way that I was going to let him strip me of my citizenship, turn me into an ‘other,’ take away my feeling of solidarity with my country or my world. All these memories flooded me when I found this 12-year-old email, and in a fit of resolve I decided to reproduce it as a woodcut. It sounds kind of corny to me now, but I remember that it felt fabulous to write it. I was ‘born again’ in high school, so I have no fear about speaking for God right back at someone who thinks that they know God’s mind. I’m very clear that I have just as much authority to speak for God as Jerry Falwell ever had. I doubt that Falwell actually read my email, but I thoroughly enjoyed the quixotic task of carving these words into a piece of wood and printing them with sumi ink. Unintentionally, and unfortunately, I write this post two days after the bombing at the Boston Marathon. What I wrote in 2001 is still true for me: “God loves every wild and incomprehensible and tender and vulnerable and beautiful and horrible bit of this world.” How do I know this? I know this because that’s what I love, and God and I are the same. Forty five years ago today, Martin Luther King was shot and killed on a balcony at the Lorraine Hotel in Memphis, Tennessee, where he had come to show support for black sanitary public works employees who were on strike. 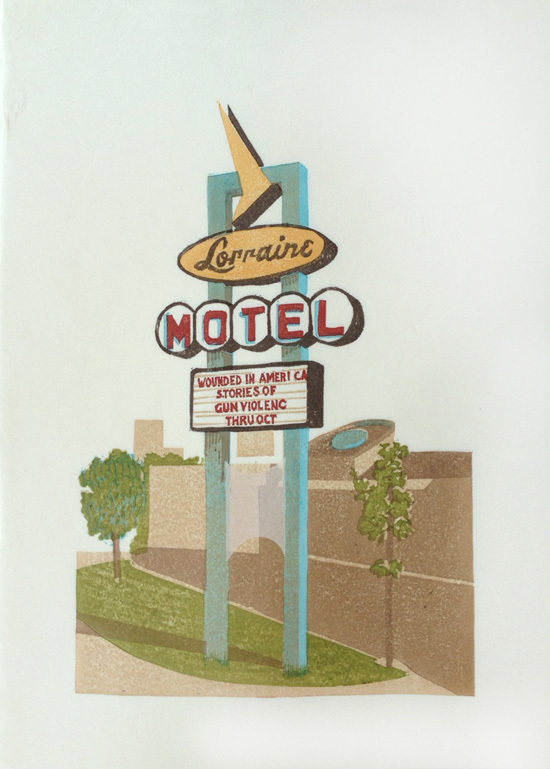 The room where King was staying has been memorialized since 1968, and in the 1990s the Lorraine was converted into The National Civil Rights Museum. I've never been to the museum, but they seem to have permanent exhibits as well as rotating special exhibits. I worked from a photograph for this print and I left the “E” off the word “violence” just as it appears in the photograph. My impression is that the National Civil Rights Museum works on a pretty low budget and I like the way the absence of the letter shows that. … if I were standing at the beginning of time, with the possibility of taking a kind of general and panoramic view of the whole of human history up to now, and the Almighty said to me, "Martin Luther King, which age would you like to live in?" ...Strangely enough, I would turn to the Almighty, and say, "If you allow me to live just a few years in the second half of the 20th century, I will be happy."